The species is a regional endemic that has experienced significant declines in the last 30 years, particularly in the last 10 years, has been extirpated from a large portion of its range, and is quite rare throughout most of its remaining range. Most populations are under some threat of habitat degradation or destruction. Cyprogenia aberti is likely not a monophyletic group and may comprise 2 and possibly 5 distinct taxa. It was generally considered endemic to the Ozark and Ouachita mountain ranges of the interior highlands west of the Mississippi River. 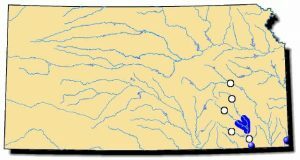 It is known historically from the Little Missouri, Saline, Caddo and Ouachita Rivers (Red River drainage); Spring, Elk, Fall, Caney, Neosho, Verdigris and Shoal Rivers (Arkansas River drainage); Little Black, Black, Buffalo, Current, Spring, Strawberry, and White Rivers, and Cane and Castor Creeks (White River drainage); and the St. Francis River. The species is now extirpated from the Caney, Elk and Neosho rivers, the Oklahoma portion of the Verdigris and Spring rivers, and from Castor and Cane Creeks, Missouri. The population in the Little Black River is not viable, although some adults still exist in a Missouri reach. Occurrences in Arkansas are more viable with populations in at least 8 rivers and locally abundant in 2 or 3. It was recently collected in the Saline River, Arkansas, after several years of supposed absence. Archaeological remains exist on Big Sunflower and Yazoo Rivers in Mississippi, but no extant populations. Comments: The western fanshell has a strikingly beautiful shell. Its wide, greenish, radiating rays give the shell a fanlike appearance. Mound-building Indians evidently revered this mussel as it has been found in various archeological/burial sites, so it may have been a prized food item. When gravid, the female fanshell slowly extrudes a white, worm-like lure (conglutinate) to attract its host fish, most being in the darter family. The core of this lure is composed of approximately 20,000 infertile eggs whose sole purpose is to give the lure a “life-like” appearance. The outer areas of the conglutinate are lined with live glochidia. If this lure is bitten by a host fish, the hookless glochidia become dislodged and some may successfully attach to the fish’s gills. The female western fanshell may release up to 30 of these 2-3 inch lures during the early summer months as fish feeding becomes more active. 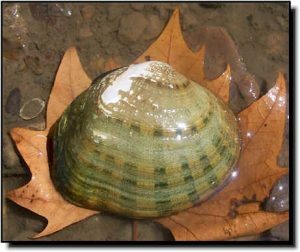 This mussel lives in gravel beds under a swift current. It is found in the Fall, Verdigris and Spring rivers but has been extirpated from the Neosho River.